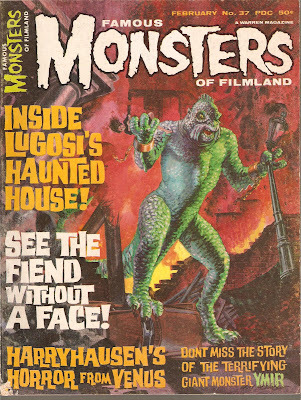 This entry features seven more covers of monster movie goodness from my collection of FAMOUS MONSTERS OF FILMLAND Magazine. This is issue no. 28 from May 1964. The cover is a painting of Lugosi from ISLAND OF LOST SOULS (1932). This is a pictures packed edition that features a filmbook on LOST SOULS as well as a feature on THE MANSTER (1959). There's also some cool behind the scenes photos showing various makeup artists applying their trade to Lon Chaney Jr. and other performers. Here is issue 29 from July of 1964. 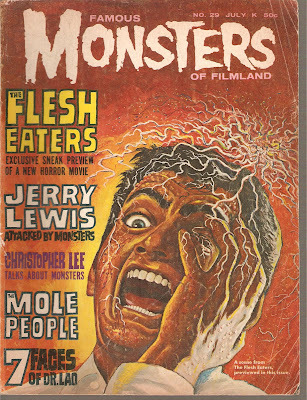 The cover is a pic from THE FLESH EATERS (1964), an excellent black and white exploitation flick with a surprising amount of gruesome violence. There's also a great article on Mexi-horror featuring a host of B/W South of the Border classics and obscure curiosities. Among the list are such films as SAMSON VS. THE VAMPIRE WOMEN (1962), THE WITCHES MIRROR (1962), THE REVIVED MONSTER (1953; the 1st Mexi-horror I think), NEUTRON, THE BLACK MASK (1962), THE VAMPIRE'S COFFIN (1958) and THE MAN & THE MONSTER (1959). There's also some choice pics from the films. Now we have the March 1965 issue no. 32. 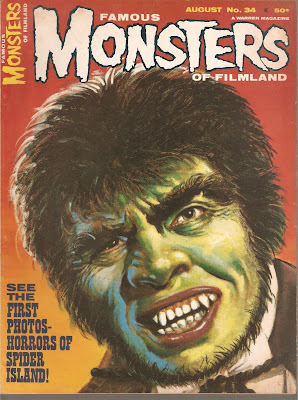 Among some highlights are an article on the talents and life of the great Lon Chaney Sr., a HIDEOUS SUN DEMON (1959) filmbook and a fascinating look at the talents of amateur model makers and their monstrous creations. SUN DEMON was one monster movie I always wanted to see, but never got around to checking it out. The August 1965 issue (no. 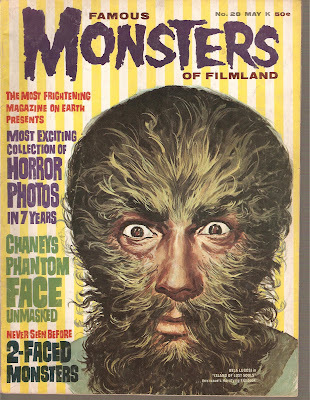 34) is a monsters packed edition featuring a look at movies such as HORRORS OF SPIDER ISLAND (1959), WARLORDS OF THE DEEP (1965) and HERCULES AGAINST THE MOON MEN (1965; listed as MACISTE VS. THE STONE MEN). The cover ghoul is the Fredric March version of DR. JEKYLL & MR. HYDE (1932) and there's an accompanying article on the other versions at the time. Issue no. 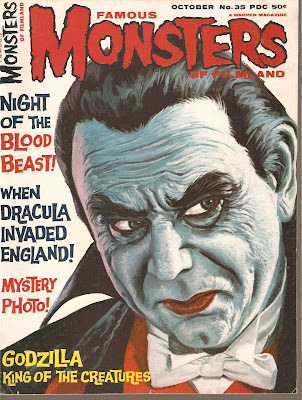 35 features Lugosi's Dracula as its front page creature. 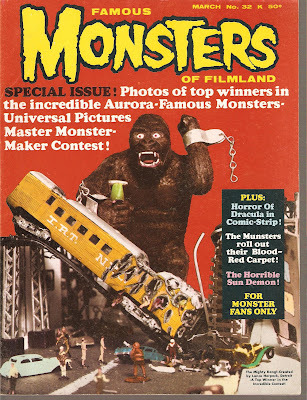 This issue of particular interest in that it features an article entitled 'Lost Monster Movie Found'. The film is called PEER GYNT from 1941 and it features the debut of a 17 year old Charlton Heston! I've never heard of this one, but there is a DVD available of it. This issue also features a filmbook on NIGHT OF THE BLOOD BEAST (1965) and another on the original GODZILLA (1954). Famous Monsters no. 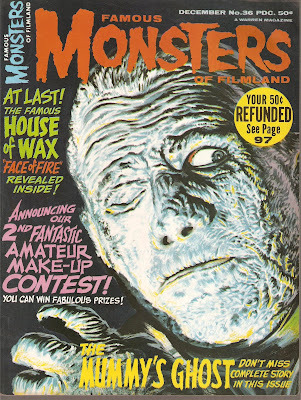 36 from December of '65 features Lon Chaney Jr. from THE MUMMY'S GHOST (1944) as well as a filmbook inside. The Universal Mummy movies I remember quite well from early Saturday mornings on local stations. There were always monster movies on early in the morning after a dose of the cartoon BATTLE OF THE PLANETS and ULTRAMAN. There's also an article on ST. GEORGE & THE SEVEN CURSES (1962) before it came to be called THE MAGIC SWORD. 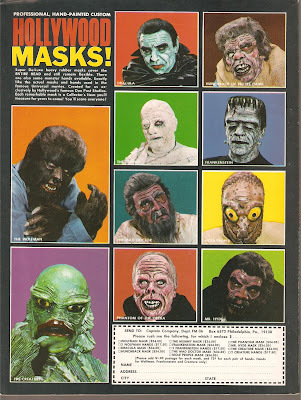 On the back cover there's a nice ad for masks being sold through Don Post Studios. Finally, it's issue 37 from February, 1966. The monster on the front page is the Ymir, Harryhausen's creation from 20 MILLION MILES TO EARTH (1957), one of my all time favorite monster movies. There's a filmbook on the film as well as a concluding one for NIGHT OF THE BLOOD BEAST (1965). There's also an interview with Boris Karloff. An article on RETURN OF DRACULA (1958) and the frequent and humorous 'Headlines From Horrorsville' round out this fang-tastic issue. No. 34 = easy favorite, though I love the King Kong mockup! I've got a lot of favorite covers of these, Carl. The painted ones are awesome. Later in the run, they stopped the painted covers and went with actual pics from the films. The issue with the Kong mockup has some awesome fan made models of various monster movie scenes. I was featured in Issue #34 as a 2nd place winner of FJA's movie contest in 1964." Seigfried Saves Metropolis" was the script I chose for stop motion animation and set building purposes. Yes, I remember that! Do you have that issue, drussell? If not, I can scan that portion of the issue and post it in a future entry.